This new window card invites children to learn the Mysteries of the Rosary in a new and unique way! For each of the 20 mysteries the reader is given a brief description and then invited to open a window revealing a compelling picture with the accompanying mystery text printed on the inside flap. 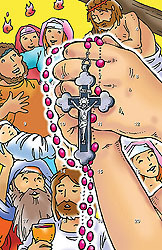 A brief thought starter introduces the card and instructions to pray the Rosary are also included as well.